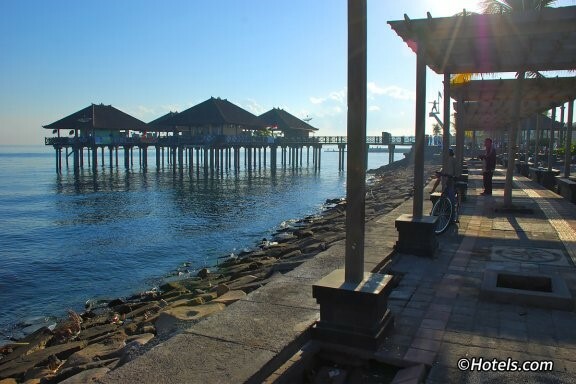 This old and defunct seaport is a favourite weekending site among locals, with the Ling Gwan Kiong Chinese temple at one end of it and the Pura Segara sea temple at the other. The port features a sheltered boardwalk and a well-paved open-air space where locals jog, cycle and exercise. Next to the coastline is one of Singaraja’s iconic monuments – the Tugu Yudha Mandala Tama – with a separate statue of a patriotic figure holding a sharpened bamboo with the Indonesian flag, pointing seaward. Local families treat their kids to fun times at the playgrounds and there are also food stalls, a public restroom and a security post onsite. Entry to the port is free.